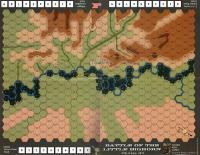 Battle of the Little Bighorn is a tactical level, two player game, with each player commanding either the US Cavalry or the combined tribes of the Plains Indians. The game includes Leaders, Mounted/Dismounted troops, Melee & Fire Combat, Ranged Fire, Morale, Villagers, Pony Herds, Horse Holders and Ammunition Supply. June 25th and 26th, 1876 Eastern Montana Territory. The Battle of the Little Bighorn, also know as Custer’s Last Stand, was the epic fight between a massive combined force of Plains Indian tribes and the 7th US Cavalry under the command of Lt. Col. George Armstrong Custer. The battle was by far the most famous event in the Indian Wars and was a crushing victory for the Indians. Custer, already famous for his Civil War exploits, became an American folk legend. Little Bighorn was the last great victory for the Sioux and Cheyenne tribes. Defiant and proud, they were determined to preserve their way of life. But within a year the great Sioux nation was broken and defeated by a nation swept up in the emotions of the Centennial and bent on revenge and retribution for the death of one of America’s most popular military heroes. 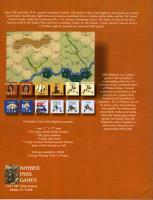 Several scenarios are included so that players may explore both historical and hypothetical situations.